Development Dimensions International (DDI) and The Conference Board have recently released a report, “Global Leadership Forecast 2014|2015.” This report, the seventh of its kind published by DDI, includes survey responses from 13,124 leaders, 1,528 global human resource executives, and 2,031 participating organizations. The volume of respondents allowed DDI to look at findings from a variety of perspectives – multinational vs. local corporations, spans four leadership levels and leaders/HR professionals of different genders, ages, 48 countries, and 32 major industry categories. The report is comprehensive and contains more than one blog post’s worth of data and insight, so I’ll just pull a few of the highlights here… But if you find the data interesting make sure to take a look at the full report for more information! 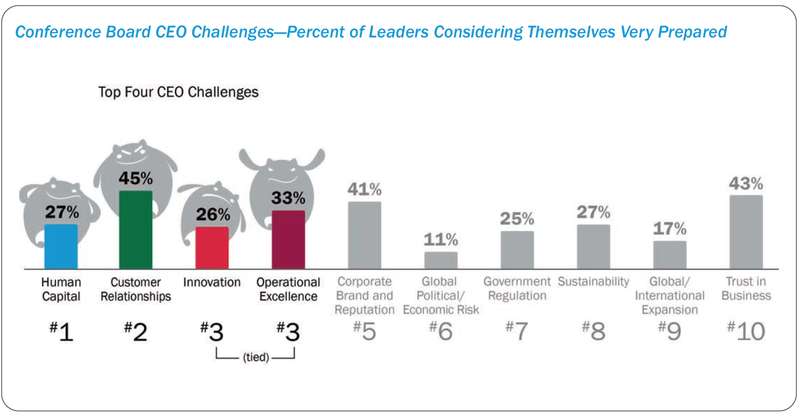 Though the top three cited strategies for combating the human capital challenge were to: provide employee training and development, raise employee engagement, and improve performance management processes and accountability, the fact that a focus on leadership was present among the top 10 strategies suggests that leaders recognize that organizations cannot develop and retain highly engaged, productive employees without effective leadership and leadership development programs. Unfortunately, no more than 50% of leaders assessed their own readiness to address such tasks as “very prepared.” And HR leaders’ perceptions were even more grim, with only 9% indicating their leaders were “very ready” to address the human capital challenge. 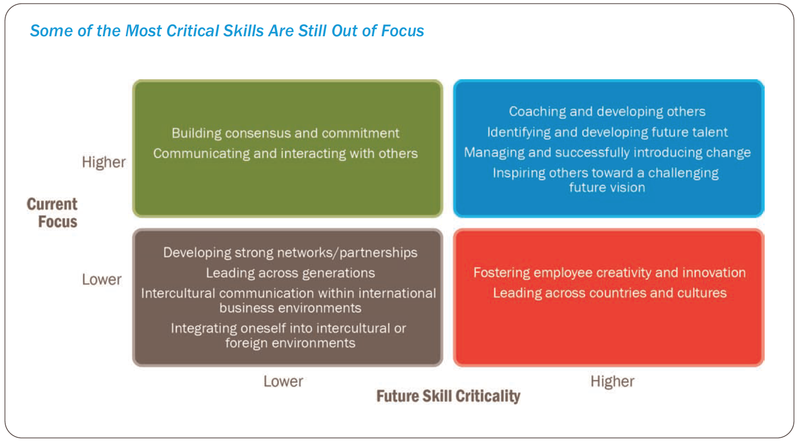 As you can see in the above graphic, two skills that were listed by HR as most critical (fostering employee creativity and innovation/leading across countries and cultures) are not actually being focused on, while building consensus and commitment/communicating and interacting with others are two skills not listed by HR as highly critical to the future yet are being heavily focused on. DDI informs us that because these are foundational skills it’s easy for HR to either overemphasize or undervalue them, which supports the data we see in the graphic. While DDI and The Conference Board’s report is chock full of fascinating data like those mentioned above, it has been getting wide attention for a particular section of the report: the section on gender diversity. The report indicates that organizations with better financial performance have more women in leadership roles. 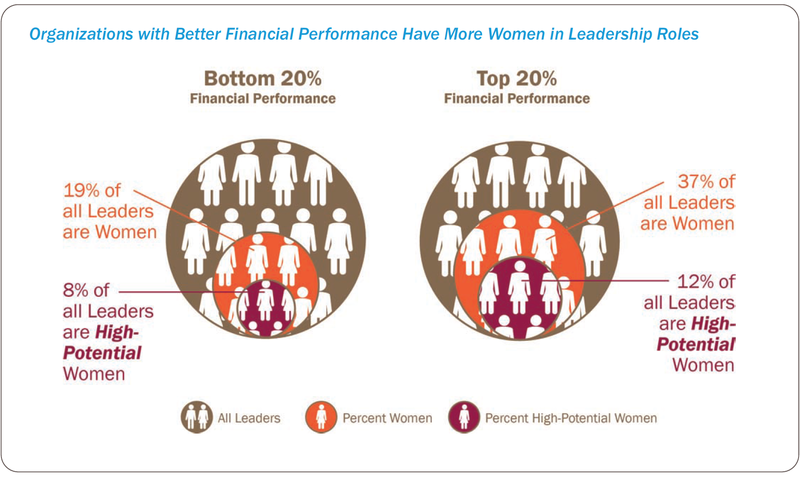 Organizations in the top 20% for financial performance report 37% of all leaders are women vs. organizations in the bottom 20%, which report that only 19% of all leaders are women. While this clearly points to the positive benefits of gender diversity, at the same time, it highlights how disturbingly imbalanced the gender demographics still are when it comes to leadership. DDI’s survey explains this imbalance in several ways. 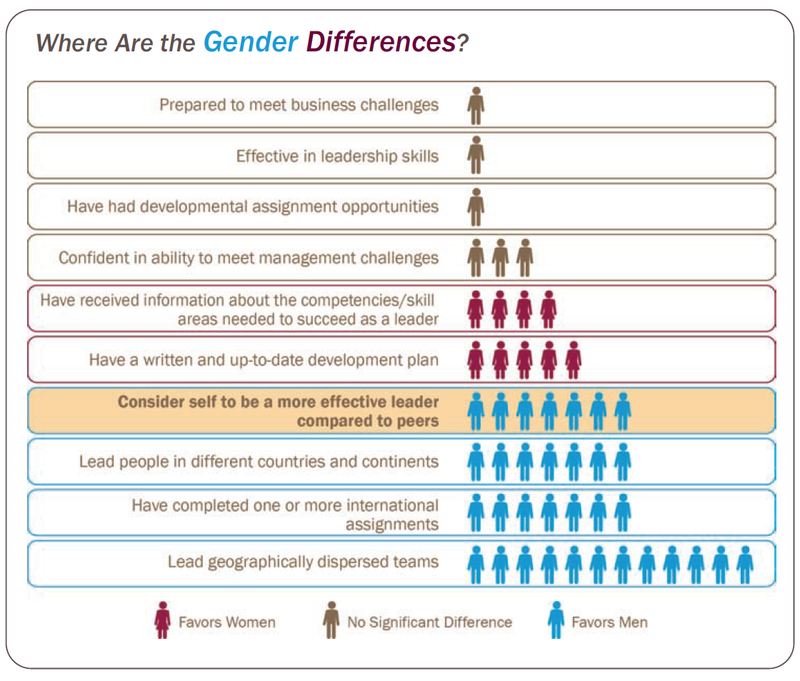 There was no significant difference between the men and women in the study when it came to leadership skills or ability to handle management and business challenges, however, a noted difference between sexes were their levels of confidence. Women were less likely than men to rate themselves as effective leaders, as having completed international assignments, lead across geographies or countries, or lead geographically dispersed teams. The study cites these global or more visible leadership experiences as key missed opportunities, because leaders who had access to these experiences were far more likely to be promoted and to advance more quickly in their organizations. The bottom line is that this data supports what we know about diversity in its entirety: fostering and encouraging diversity in the workplace is always something to strive for as it inherently leads to more diversity of ideas, problem solving, productivity and financial success!